Chances are that if you’ve been following us on Facebook, you’ve probably realized that the TACAIRNET team has a profoundly deep love for the McDonnell Douglas’s F-15 Eagle, now produced and serviced by Boeing. The Eagle was intended to be the US Air Force’s multirole replacement air superiority fighter for the F-4 Phantom II, another McDonell Douglas product. Thoroughly well-built, it was “over-designed” to best the perceived capabilities of the mysterious Soviet MiG-25 and then some. Just how well-engineered is the F-15? Well, let’s put it this way: how many fighter jets have you heard of that are able to function and land with one wing completely torn off? 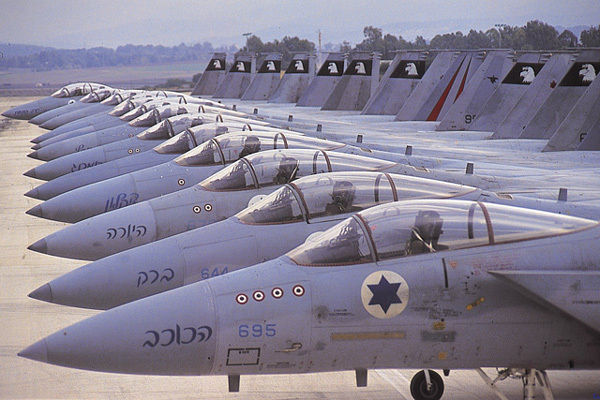 IAF F-15 Eagles on the flightline. Photograph courtesy of IAF. On the 1st of May, 1983, in the skies over Negev, Israel, two F-15Ds of the IAF’s 106 Squadron were hounded mercilessly by four A-4N Skyhawks of 116 Squadron during a training exercise. One of the Eagles, #957 (named Markia Schakim; “Sky Blazer”), was piloted by Zivi Nedivi, one of the newest Eagle drivers in the IAF. Riding shotgun in the weapons system officer’s cockpit behind him was Yehoar Gal, a highly-experienced instructor pilot, who’d be monitoring Nedivi’s performance during the training run. 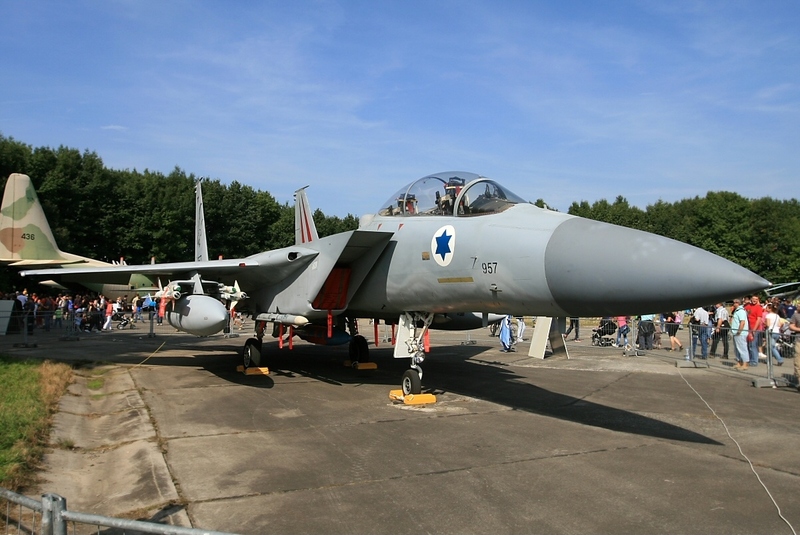 The F-15, called “Baz” (Hebrew for “falcon”) had already been serving with the IAF for a little over six years, and the jet Nedivi and Gal were in was one of the younger models in the air force’s inventory. Even still, Baz 957 was already a combat veteran, having scored four kills during the 1982 Lebanon War. This particular exercise, which Baz 957 was a part of, was designed to simulate air combat; however, no aircraft would be lost during such a run… or so everybody involved thought. Nedivi and his wingman dodged and wove through the skies, deflecting and then attacking the Skyhawks in what pretty much looked like a scene out of Top Gun. In training runs of the sort, limitations and restrictions are put in place to keep all aircrew involved safe, especially from possible collisions. The distances in typical dogfights can range up to miles, but even in simulations, sometimes things get a little too close for comfort. 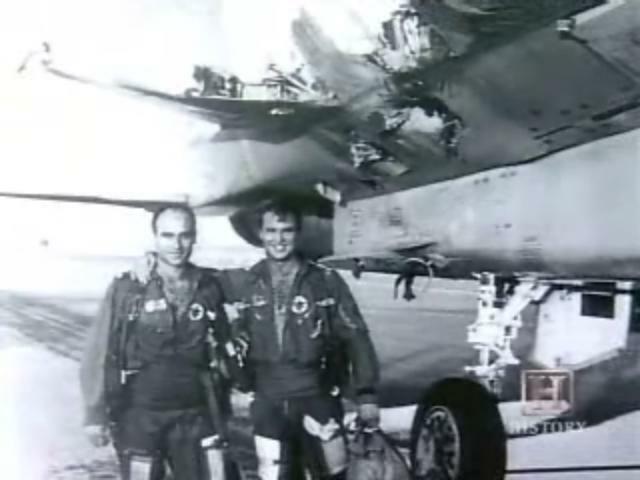 The pilot of the number 3 Skyhawk, #374, aiming for a kill on one of the F-15s, figured he would be able to engage with a missile and so attempted to move his fighter into position to achieve a lock. Inverting his aircraft and pulling up, he wasn’t aware of Baz 957 right above him, which Nedivi was frantically trying to maneuver out of the way. In a matter of seconds, 374’s wing ripped into Baz 957’s wing root, shearing off the right wing of the F-15. At this point, Nedivi and Gal should have probably ejected, considering they were flying without a wing, and generally-speaking, you need two wings to fly. However, neither Nedivi nor Gal knew that they were missing a wing. Nedivi flew through the impact, immediately cognizant of the fact that they had collided with Skyhawk 374, which twisted off and exploded. Thankfully, the pilot of that bird was able to escape with his life after quickly yanking on the ejection handles of his Martin Baker seat. Back to Baz 957, the stricken Eagle was now in a 30-degree nose-down attitude and spiraling insanely. Nedivi and Gal’s helmets erupted with radio chatter, alerting them to the obvious- they were in a world of danger and needed to punch out right away or they’d go down with their aircraft. Nedivi told Gal over the intercom to prepare to eject as soon as he could stabilize the fighter for a brief second. Zivi quickly worked to reconnect to the control surfaces and was able to level out temporarily. Thinking that he managed to regain full authority over his badly-damaged Eagle, he once again got on the intercom. This time, he told Gal to stay with him. It was now time for Nedivi and Gal to evaluate the condition of their aircraft, since they needed to know what obstacles they faced prior to attempting to land the Eagle. What Nedivi could see was that his right wing was streaming fuel, his fuel indicator for that wing (the Eagle’s wings function as fuel tanks) showed the tanks as being completely empty, and that he was losing control once again. Both were wholly unaware of the fact that they were missing a wing. Nedivi attempted to slow down his Eagle marginally, but that threw it into yet another spin to the right, wingless side. Slamming forward his throttles, his afterburners engaged and the Eagle picked up speed, giving him control of the aircraft once again. While Gal coordinated landing efforts over the radio, Nedivi gentled eased Baz 957 towards the nearby Ramon Airbase, dropping the arresting hook in preparation for a rough landing at a higher speed than usually advised for a landing. Crossing the threshold of the runway at 260 knots (more than twice the recommended landing speed), Nedivi snagged the cable with his tailhook. The tailhook isn’t built for those kinds of speeds, so when it caught onto the wire, the Eagle kept going but the tailhook stayed, effectively ripping it off from the underside of the aircraft. Yet another part of Baz 957 that went missing that day. Ground crew flipped up the emergency barrier to prevent the fighter, still barreling down the runway from overshooting. Thankfully, Nedivi, who was standing on the brakes by now, was able to finally bring it to a stop a mere 20 feet from the end of the runway. As they were in the final stages of slowing down, Nedivi’s wingman piped up on the radio, exclaiming that neither Zivi nor Yehoar would believe what they were flying with (or, rather, without). As Zivi popped open the canopy and reached over to shake Gal’s hand, he noticed for the first time, a most horrific sight. What was originally obscured by the massive flow of fuel spewing out from the side of the Eagle, was now very visible: the right wing was completely sheared off with a small jumble of wires and a bunch of twisted metal hanging out from the wing’s root in the fuselage. So what exactly was it that saved that Eagle? Was it just plain luck, Nedivi’s masterful flying, or the Eagle itself somehow? Well, if it’s any consolation, IAF mechanics were wondering the exact same thing themselves after towing Baz 957 off of the runway to a hardened hangar for inspection. Investigative engineers at McDonnell Douglas at first thought it was a taxiing accident. Perhaps a careless pilot lacking situational awareness bumped his jet into another, or maybe a structure, and that’s how the wing went missing. When they were informed of how things actually went down, they were astounded… this just wasn’t possible. Science, a bit of research and scale experimentation determined that the F-15’s fuselage, especially its huge horizontal surface area, its other wing and the stabilators at the rear worked together to continue generate lift. No other aircraft in the world could fly like this. Of course, a lot of it came down to the pilot, and Nedivi more than proved himself as being a truly capable, and highly-commendable airman in this instance. Zivi and Yeohar, post-flight. Photograph courtesy of IAF. Baz 957 was later loaded onto a flatbed, taken to an IAF maintenance facility and fully repaired, new wing, tailhook and everything. In fact, it flew in combat yet again in 1985, sharing a kill of a Syrian MiG-23. Now retired, it’s parked in an outdoor museum in Israel, a testament to Eagles and the pilots who are privileged with flying them.